Wanna see my first selfie? True confession: I am 63 years old and this is my FIRST SELFIE. When I took it two nights ago and sent it to my three daughters, one responded that she wished more people my age had never taken a selfie. Hmmmmm……..not sure exactly how to take that. However, the more I looked at the photo yesterday, the more I wanted to retake it, because it’s obviously blurry, my eyes look a little crossed and I really want some lipstick. It’s definitely not perfect, and I am a perfectionist. But if I retook it, then it wouldn’t be my FIRST selfie, would it? So I left it alone and I’m sharing it with you because you probably needed something to give you a little smile today. I’ve noticed that the more books I write, the more I relax and the more of my personal–not just professional–self shows through. This is book number five, (not counting the inspirational commentary for the He Cares New Testament), so I’ve really chilled on this one. I’ve gone ahead and let my quirky sense of humor show. For ages I’ve used it with cancer patients and their caregivers as a way to lift spirits during difficult times (#yesimayhavetakenafartmachinetothechemoroom), but that’s easier done in person than in a book. So I hope when you read this book, those meant-to-be-humorous comments make you smile and not just wonder about my sanity. I also wanted the format of this book to be different from my other books, so I began each chapter with a quote from a famous person or character. You’ll hear encouragement from Snoopy, Anakin Skywalker, Bob Dylan and Steve Martin to name a few. Don’t worry, I’ve also included some more traditional founts of wisdom like Mother Theresa, Dr. Martin Luther King Jr. and Corrie Ten Boom. Of course, as always, the main source of inspiration will be the very Word of God. Because I’m a newspaper reporter turned author, when I write I like to start with facts and let them create feelings. I am not good at making things up. (How people write fiction is beyond me!) In my books I tell true cancer survivor stories and share true biblical hope. I like to think of myself as a passionate encourager who always is a truth-teller. At the end of this book, I’ve added three bonus chapters for those facing cancer that is not considered medically curable. I know so many people in this situation of “chronic” cancer/cancer-for-the-long haul that I wanted to address some of their particular needs. Each chapter in the book also ends with what I call a “Path to Peace”–a few words intended to pour truth into your mind and peace into your heart. My prayer for all who will read this book is that you’ll discover how to foster peace in your own home and life, as well as how to find God’s supernatural peace in your heart and mind–regardless of your or your loved one’s medical prognosis. 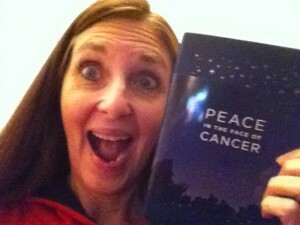 Peace in the Face of Cancer will be released next month and available in bookstores and online. I’ll be posting excerpts in the coming weeks and asking some of you to hep me launch its release. Thanks for reading today and I hope you join me in thanking God for what He has amazingly done with a four-finger typist who never really wanted to write any books.